In the 2nd Congressional District, Jeff Van Drew, left, won the Democratic nomination and will take on Republican Seth Grossman in November to replace retiring Republican incumbent Frank LoBiondo. In the 4th Congressional District, Joshua Welle, right, won the Democratic nomination to face Republican incumbent Chris Smith in the general election. With Democrats looking to contest at least four Republican-held congressional seats in the November mid-term elections, New Jersey could play a significant role in the effort to flip a total of 23 GOP seats to seize control of the U.S. House. 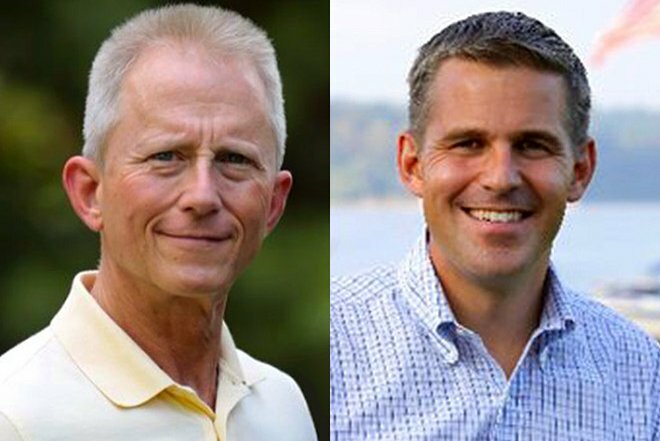 Here's how the local congressional races for November are set up after Tuesday's primary. The tallies are unofficial. In the 1st Congressional District, which includes 52 municipalities in Burlington, Camden and Gloucester counties, Democratic incumbent U.S. Rep. Donald Norcross of Camden turned back challengers Rob Carlson, an information technology director, and electrical contractor Scot John Tomaszewski. With 96.4 percent of precincts reporting, Norcross had 83.8 percent of the vote to 9.9 percent and 6.3 percent for Carlson and Tomaszewski, respectively. In the general election on November 6, Norcross will face Republican Paul Dilks, a reverse mortgage specialist, who was unopposed in the primary. In the 2nd Congressional District, which includes 92 municipalities in Atlantic, Burlington, Camden, Cape May, Cumberland, Gloucester, Ocean and Salem counties, Democrat Jeff Van Drew of Cape May Court House will take on Republican Seth Grossman in November in a race to replace retiring Republican incumbent Frank LoBiondo. With 99 percent of precincts reporting, Van Drew, a state senator, had 55.4 percent of the vote to 19.2 percent, 16.8 percent and 9.7 percent for retired schoolteacher Tanzira "Tanzie" Youngblood, former congressional aide William Cunningham, and farmer and activist Nate Kleinman, respectively. On the Republican side, Grossman, a lawyer, collected 39.1 percent of the vote to 30.4 percent, 23.5 percent and 7.1 percent, respectively, for engineer Hirsh Singh, former state Assemblyman Samuel Fiocchi and former FBI agent Robert D. Turkavage. In the 3rd Congressional District, which includes 52 municipalities in Burlington and Ocean counties, Republican incumbent Tom MacArthur of Toms River had no opposition in the primary. Neither did the Democratic nominee, Andy Kim, a national security expert who was a strategic adviser in the war in Afghanistan. They will face off in the general election. In the 4th Congressional District, which incorporates 40 municipalities in Burlington, Mercer, Monmouth and Ocean counties, Democrat Joshua Welle won the battle to face Republican incumbent Chris Smith in November. With 99.8 percent of the precincts reporting, Welle, a veteran of the U.S. Navy and businessman, collected 57.2 percent of the vote to 42.8 percent for Jim Keady, a former Asbury Park councilman. Smith was unopposed in the primary, but could face an anti-Trump wave in the general election as Democrats hope to flip the seat. Democratic incumbent U.S. Sen. Bob Menendez will be challenged by Republican Bob Hugin in November. Menendez turned back a primary challenge from Lisa McCormick, a mother and small business owner, winning 61.9 percent of the vote to her 38.1 percent, with 93.1 percent of the precincts reporting. On the Republican side of the ballot, former drugmaker CEO Hugin defeated construction company executive Brian Goldberg, 75.4 percent to 24.6 percent. Menendez is seeking election to his third term after his federal corruption trial ended in a hung jury and mistrial in November. Federal prosecutors decided not to retry him. Full disclosure: U.S. Rep. Donald Norcross is the uncle of PhillyVoice Founder and CEO Lexie Norcross.